The Tamil National Alliance (TNA) parliamentarians Thursday decided to support the motion of vote of confidence in the United National Front government, led by its Prime Minister Mr.Ranil Wickremasinghe, in Sri Lanka's parliament when it meets after prorogation. The notice of the motion is likely to be handed over to the Speaker Wednesday with signatures of about 130 parliamentarians, the UNF Chief Whip and Minister Mr.Mahinda Samarasinghe said Wednesday. Mr.Mahinda Samarasinghe said at the press briefing held Wednesday at the Prime Minister's official residence, Temple Trees‚ that about 127 MPs have signed the motion of vote of confidence in the UNF government, media sources said. Former Interior Minister John Amarathunga at the Prime Minister's official residence today at the press conference. 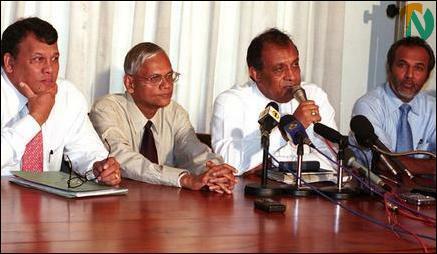 Ministers Karu Jayasuriya, Rauff Hakeem, John Amaratunge, G.L. Peiris and several other ministers participated at the conference. Minister Peiris is to hold an important press conference Thursday. The Tamil National Alliance parliamentarians have expressed their support to the UNF government led by Prime Minister Mr.Ranil Wickremasinghe through individual affidavits. They handed over their affidavits to the UNF government chief whip Mr.Mahinda Samarasinghe Wednesday, sources said. 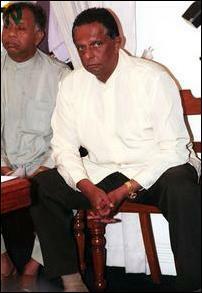 "Since the formation of a government in December, 2001 with Hon Ranil Wickremasinghe, M.P. as prime Minister, in view of the policies formulated by the Ranil Wickremasinghe government, to evolve through the process of dialogue, an acceptable negotiated solution to the Tamil question, and the practical steps taken by the Ranil Wickremasinghe government to institutionalize a ceasefire, and to commence a direct a dialogue with the Liberation Tigers of Tamil Eelam, as representing the Tamil people in keeping with the mandate received by the Alliance of Tamil parties-comprising the Tamil United Liberation Front, All Ceylon Tamil Congress, the Tamil Eelam Liberation Organization and the Eelam Peoples Revolutionary Liberation Front (Suresh wing), elected in the name of the Tamil United Liberation Front at the general elections held on 5th December, 2001 and in view of the commitment of the Ranil Wickremasinghe Government to the furtherance of this objective- I as a member of parliament elected at the said elections have extended and continue to extend my support to the Ranil Wickremasinghe government. Constitutional Minister G.L Peiris addressing the press conference today at the Prime Minister's official residence. 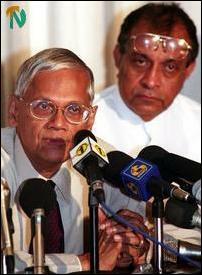 United National Front (UNF) government deputy leader and power and energy Minister Karu Jayasooriya is seen behind Peiris. "The Liberation Tigers of Tamil Eelam have responded to the Government's proposals for an Interim Administrative arrangement and talks are expected to resume shortly to evolve an acceptable Interim Administration arrangement, which will give the Tamil speaking people adequate self-government opportunities in the North-East to rebuild and reconstruct the devastated North-East to resettle hundreds of thousands of displaced people, and bring about the urgently required socio-economic development in the North-East. I am convinced that my continued support to the Ranil Wickremasinghe is imperative at the juncture and I pledge to continue to support the Ranil Wickremasinghe both inside and outside parliament, in order to ensure that there is peace and prosperity in the North-East, and in the whole of Sri Lanka." United National Front (UNF) government deputy leader and power and energy Minister Karu Jayasooriya (center) addressing the press conference. 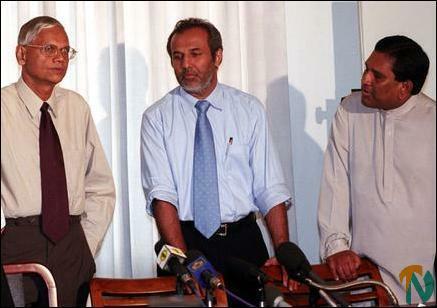 Sri Lanka Muslim Congress leader and port Devolopment Minister Rauf Hakeem(right), Constitutional Minister G.L Peiris and Labour Minister Mahinda Samarasinghe (left) are also seen. Constitutional Minister G.L Peiris talks with Rauf Hakeem and Rajith Senaratna before the press conference.